As I was climbing Mount Evans with a few Colorado locals, I made reference to one of the hills I had climbed in the Southeast. One of the guys turned and looked at me, and jokingly said “You guys have hills out there?” He had a good point. In terms of elevation, the Blue Ridge pales in comparison to its western counterparts. I had practically lived around 10,000 feet for most of my Colorado stay, and climbed above 11,000 several times, including once over 12,000 feet, and the big one came in at 14,100. Many of those climbs were above the treeline, and yielded views that far surpassed anything we have on the East coast. But the climbing is different. I was reminded of that when I came back and attempted the Blue Ridge Brutal. Instead of long and gradual climbs, we have short and steep. My legs hurt far more after this ride than anything I had done in the Rockies. Not to take anything away from the Rockies, as I loved every minute of my stay, but the Southeast has some pretty amazing climbing if you ask me. Let me back up a little bit. Earlier this year when looking for good climbing blogs, I bumped into The Climbing Cyclist. To my surprise, Matt’s website was very similar to mine, only he covered the other side of the world — Australia. I enjoyed reading about his adventures, and shot him a quick note to let him know. Of course I also let him know about my website. As it turned out, he was planning on a trip to the states later in the year. He would be looking for good places to climb. Did I have any suggestions? Of course I recommended some of the climbs in our corner, and his interest was peaked. I checked his website a few months later, and to my surprise, he had just climbed Mount Baldy outside of Los Angeles. He then headed to New Orleans, then to New York, and finally to Washington, DC. We emailed again. He was asking about places to climb near his last two stops. He had already spent some time riding around New York City, and would soon be climbing Whiteface Mountain at Lake Placid. I suggested he try some of the climbs in Vermont, but that didn’t work out. As for Washington, I had no idea, but thought he could try Skyline Drive or the Parkway near Roanoke, Virginia if he was willing to drive a ways. Then I get an email saying he had set aside a few days, and wanted to try the Blue Ridge Mountains. Which would I suggest, Asheville or Boone? That was like asking a loving mother to pick her favorite son. Ultimately I suggested Asheville because it is a bigger city, and he would be relying on local transportation to get to and from the climbs. As for where to climb, my first suggestion was the Blue Ridge Parkway up to Mitchell. Why go small, right? It would be quite a climb, but it is also the highest point east of the Mississippi River, and is probably one of the best climbs of the Southeast. He toughed it out, made it up to Mitchell, and came back down elated. The next day he decided to head out the opposite direction on the Blue Ridge Parkway, heading up to the top of Mount Pisgah, then back down Town Mountain Road. While the grades were not terribly steep, Matt found them to have their own unique challenges. One thing he noticed is that there is not a lot of consistency. You will be climbing at the same grade for awhile, then you will reach a flat or even a downhill before climbing again. What Matt didn’t find, was that southeast climbing can be STEEP! In fact, a lot of the climbs up to the Blue Ridge Parkway are tougher than the Parkway itself. He may have found that out if he could have ridden from Brevard, but alas, transportation was an issue. I highly recommend you read Matt’s take on Asheville and the Blue Ridge Parkway. It’s a great read, and a great adventure. Even though he went through a lot of trouble to get here, I’m glad that he was able to enjoy it. The only real negative was that nobody recognized him as Australian, and one could mistook Australia for Austria. C’mon Americans! Now back to Colorado. The tough part about climbing in Colorado is not really the elevation profiles. They are long, but most that I tried are relatively smooth and easy. Independence Pass was a long, gradual climb, averaging 3% over 16 miles. Mount Evans was a little steeper, averaging 4.5% over 27 miles. I understand there are some steeper climbs around the foothills. Magnolia Road near Boulder is known for being steep. Overall, they still seem to be an easier lot easier lot to climb. What gets you in the Rockies is the elevation. I was maybe half the climber I had been in the Blue Ridge. Without being used to breathing such little oxygen, I simply could not push myself to muscle exertion. As a result, these rides were mostly slow and methodical. Believe it or not, I actually lost fitness when I got back home, as evident by my performance in last week’s Blue Ridge Brutal where I was 91st out of 135. I’m not saying that Rocky Mountain climbing is easy in comparison. Quite the contrary! Mount Evans was possibly the most difficult thing I’ve ever done on a bike! Our climbs are also hard, and not to be discounted. They are simply different. This entry was posted on Wednesday, August 22nd, 2012 at 7:28 pm	and tagged with asheville, australia, blue ridge mountains, climbing, cycling, independence pass, Mount Evans, mount mitchell, rocky mountains, vacation and posted in Blog. You can follow any responses to this entry through the RSS 2.0 feed. I get a bit tired of the attitude of some relatives who live in the Rockies. Sure, in the Southeast there aren’t many climbs longer than 5 miles. However, we definitely make up for it with inconsistent grades and STEEPNESS. We have quite a few long climbs in WNC. Mitchell is a very long climb from either Marion or Asheville. 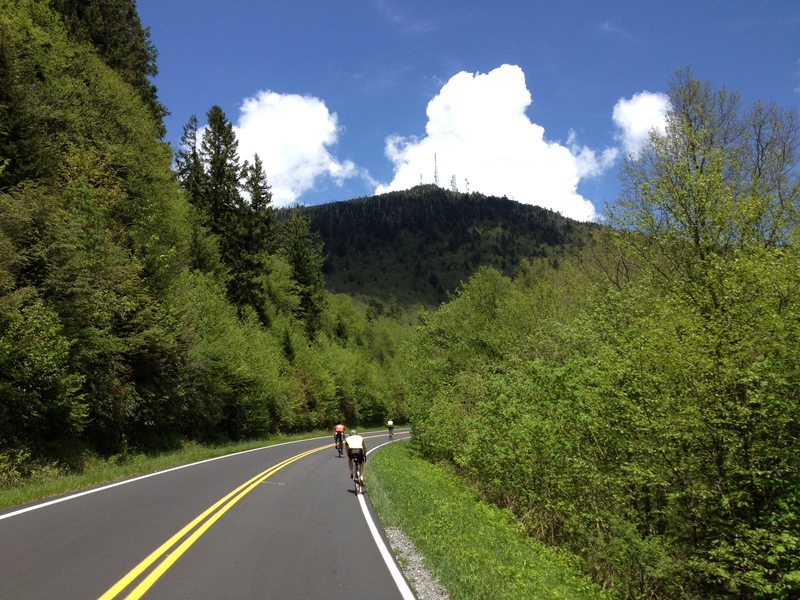 There are some 10-mile climbs on the Parkway, and don’t forget Clingman’s Dome is a 20+ mile climb that was tougher than anything I did in Colorado save for Evans. Excellent as always Aaron! I do agree with you, though my last ride out West was 24 years ago. I remember LONG climbs and the lack of O2. It seemed like it took awhile for the pain to hit out there. Some of these climbs back East hit you in the face from the get go. Yep, from what I understand, there are few climbs out west that compare with Howard Gap, Pinnacle, Becky Mountain, or the Tryon trinity. Agree 100% with you. I found the grades while out in Colorado to be mild compared to what I regularly face up here in SE Pennsylvania. Lots of rolling but steep hills – and like you said there’s really no super long climbs around. I feel like the rolling hills helped me while riding in the Copper Triangle – there was a bit of a rolling section through Vail and I dropped the other guys during that part. Very steep! Was that 25% the other day? We have a handful of those, but tend to stay away. Rolling hills are a different type of riding, and some people drop me on them. I’m not the type to try and power over the hill. I have a climber’s mentality (somewhat lazy), and tend to downshift and spin my way up. Vail was the only section I saw big grades, and they were very short. I struggled during those because of the O2. Yep, that climb did get up to 24% (per Strava). Super short but crazy steep. I’m kinda crazy though now – I like hard climbs and will probably go back to visit that hill in the coming days! And as you say, different is accurate and legitimate without regard to winning a rather pointless argument. Interest post, Aaron, thanks as always! That is very interesting about how the Blue Ridge. Puts the Assault on Mount Mitchell in a different perspective. One thing I meant to mention in the post is that one of the reasons the grades are easy in the Rockies is because they need snow vehicles to get through. We don’t have that problem as much. Agree that there’s no sense in arguing, but people do tend to get prideful of their local terrain, myself included. Nice one, Aaron. I agree completely. Both have totally different profiles. For a rider of either side to discount the other based on size or grade is ridiculous. Celebrate differences over beers!! Hey Bo. You bring up a great point – beer! After touring a lot of the microbreweries in Colorado, I have to say that they have the better beer hands down. All that beer might be why I lost fitness. When I moved back to Western NC from Idaho I thought I knew how to climb on my bike. It took me a good six months to get my legs and mind adjusted to how to climb mountains in the Blue Ridge versus those out west. Having worked in transportation, the main difference seems to be the era in which the roads were built. Modern advances in engineering and construction technology led to more consistent grades in the western US, whereas so many roads in the southern Appalachian Mountains were just cut straight over a mountain in the early to mid 1800s. The Blue Ridge Parkway was designed in a more modern era, which explains its consistency compared to so many of the roads in the Asheville area that get you to the Parkway. Another issue to remember is the change in elevation in similar in the east as it is in the west; you just start from and climb to lower elevations. From Asheville to the top of Mt. Mitchell is more of an elevation change (4,500 ft) than from Aspen to Independence Pass (4,000 ft gain) or from where I used to climb from Downtown Boise to Bogus Basin (4,100 ft gain). Very good points. Also, a lot of the climbs in the southeast are based on railroad grades (Saluda Grade, Todd Railroad grade, probably many others), which of course were created in the infancy of the industry. They learned their lessons, and when the railroad reached the west, they developed them to be traversed more easily. Also good point about the elevation gain. Evans had more elevation gain than Mitchell, but it really is an anomoly. Unlike in the Carolinas, there aren’t many roads in Colorado that travel to the tops of peaks, especially those above 14k feet. The mountain passes are comparable in elevation gain, but they generally are longer and not as steep than the Blue Ridge.